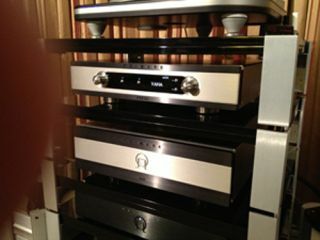 BRISTOL SHOW 2013: Primare PRE60 preamp and A60 power amp to make their debut | What Hi-Fi? Primare is set to reveal its new 60 Series product range at the Bristol Show next weekend. The PRE60 preamplifier and the A60 fully-balanced power amplifier are the first two products in the range, which promises a jump in performance over the iconic 30 Series. Primare's 30 Series includes the five-star I30 amplifier and before that the multi-award-winning A30.1, so the new range has high standards to live up to. The new A60 will deliver 2 x 300 watts at 8 ohm and 2 x 600w at 4 ohm, and combines traditional analogue circuit design with digital processing. The pair will come with two-tone bodywork and promise "state-of-the-art audio streaming performance". Further information on the products, which aren't due to be released until around May, is thin on the ground for now. We'll bring you more info and products from the show floor. You can read full details on the Bristol Show exhibitors, other new products and find out how to get discounted tickets online now, in our Bristol Show blog.